1 2 3 Misiunas, Romuald J.; Rein Taagepera; Georg von Rauch (2010). The Baltic States, years of dependence, 1940-1980. University of California Press. p. 62. ISBN 978-0-520-04625-2. 1 2 3 von Rauch, Georg (1974). Die Geschichte der baltischen Staaten. University of California Press. pp. 229–230. ISBN 978-0-520-02600-1. ↑ Statiev, Alexander (2010). The Soviet Counterinsurgency in the Western Borderlands. Cambridge University Press. p. 90. ISBN 978-0-521-76833-7. ↑ Kasekamp, Andres (2000). The radical right in interwar Estonia. Palgrave Macmillan. p. 136. ISBN 978-0-312-22598-8. 1 2 3 Smith, David James (2001). Estonia: Independence and European Integration. Routledge. p. 36. ISBN 978-0-415-26728-1. 1 2 Hiio, Toomas (2009). 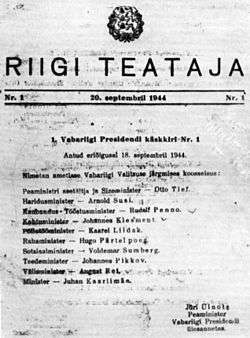 Estonia since 1944: Reports of the Estonian International Commission for the Investigation of Crimes Against Humanity. Estonian Foundation for the Investigation of Crimes Against Humanity. pp. 377–378. ISBN 978-9949-18-300-5. ↑ Miljan, Toivo (2004). Historical Dictionary of Estonia. Scarecrow Press. p. 21. ISBN 978-0-8108-4904-4. ↑ Raun, Toivo U. (2001). Estonia and the Estonians. Hoover Press. p. 163. ISBN 978-0-8179-2852-0. ↑ Laur, Mati (2000). History of Estonia. Avita. p. 275. ISBN 978-9985-2-0324-8. ↑ Hiio, Toomas (2006). Estonia, 1940-1945: Reports of the Estonian International Commission for the Investigation of Crimes Against Humanity. Estonian Foundation for the Investigation of Crimes Against Humanity. p. 1099. ISBN 978-9949-13-040-5. ↑ Rudolf Lumi (1962). Rahvatasujad (1. osa). Estonia: Eesti Riiklik Kirjastus. OL 24377325M. ↑ Rudolf Lumi (1965). Rahvatasujad (2. osa). Tallinn, Estonia: Eesti Raamat. OL 24377333M.